Workflows are available throughout Dynamics AX and are a great way to make sure that things don’t get done by the right people, in a timely manner, and also provides a great way for people to see what they need to do because only the tasks that they need to worry about are assigned to them. 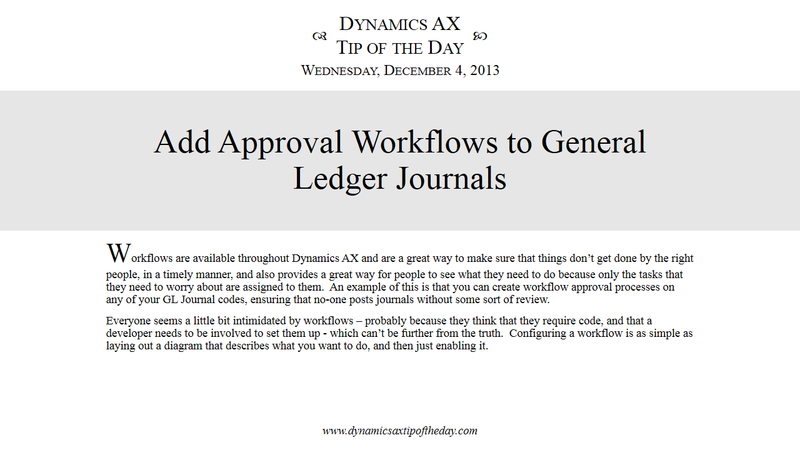 An example of this is that you can create workflow approval processes on any of your GL Journal codes, ensuring that no-one posts journals without some sort of review. Everyone seems a little bit intimidated by workflows – probably because they think that they require code, and that a developer needs to be involved to set them up – which can’t be further from the truth. Configuring a workflow is as simple as laying out a diagram that describes what you want to do, and then just enabling it.